We are pleased to announce that we have teamed up with Payment Assist and can now offer you a brand new option to pay for your stock (UK customers only). You can get your order in full and spread your payments over four months without any interest! What’s better is that for order amounts under £1000.00, there is no credit check – it is a guaranteed service! It is great for cash flow, if you are waiting for payday or invoices to be paid. It also means that if you don’t have quite enough for the whole order you will no longer miss out on items whilst waiting to accrue enough money to buy stock. Essentially, you pay 25% of the order amount up front and your order is delivered to you in full. You then have three equal monthly payments automatically taken from you to clear the balance. The minimum order amount inc VAT and delivery is £300.00. 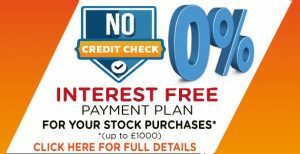 The maximum amount without credit check requirements is £1000.00 all inc. It is as simple as that. No catches or hidden fees. This is only a phone-based service at this time, so if you want to enquire further or take advantage of the plan option, call us now on 0330 113 1636 Monday to Friday 9am to 4.30pm. Payment Assist is one the UK’s leading provider of payment plans predominantly to the motor trade. When motorists are hit with huge unexpected bills, Payment Assist work with thousands of garages across the UK to help ease the burden. You can check their handy garage locator to see which ones offer the service in your area…you never know when you may need it!